#PublicCanvas is an evening-length, community-driven performance that unites vertical dance, local content, music and spoken word to reframe the experience of urban community. 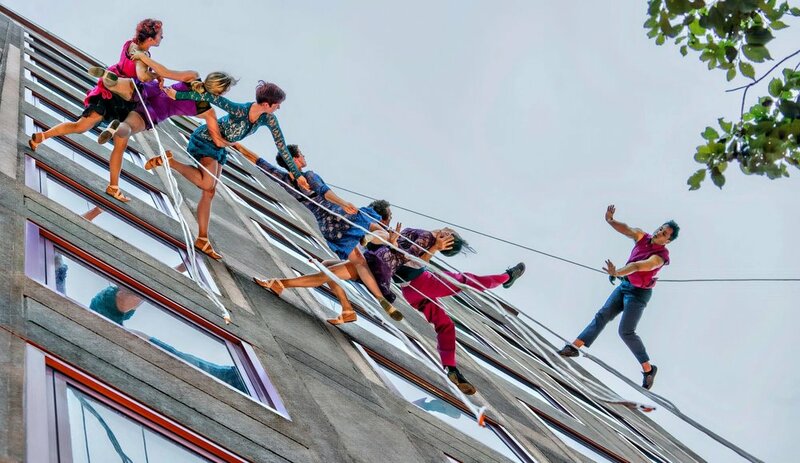 Interwoven by words and stories sourced from each local community, BANDALOOP’s full company of dancers will choreographically respond to and illuminate provoking dialogues on community, place-making and art. Intrinsically driven by the inclusion of crowd-sourced narratives representing a unique expression of each city, the performances will curate experiences that animate and draw out conversations about place-based memory, change and renewal. Built from discovery, empathy and communal sharing, the work is about human possibilities, cost of urban change, and amplifying the voices of the people impacted, expressed through the unique, site-immersive, perspective-changing art of vertical dance. Interested in presenting #PublicCanvas in your community? To help guide you as you think about how #PublicCanvas might work in your community, we've put together a #PublicCanvas Playbook (PDF), which takes you through the basic steps needed to create a successful community-driven collaboration. To obtain further booking information for #PublicCanvas, please email us at booking@bandaloop.org. Watch the opening duet performance from the Providence RI premiere of #PublicCanvas, produced in collaboration with PVDFest, featuring BANDALOOP dancers Melecio Estrella and Jessica McKee, and spoken word artist/singer Tassiana Willis. Scenes from #SFPublicCanvas premiere. The work fused dance, spoken word and moving images to create public discourse around the rapidly changing landscape of the Tenderloin/Central-Market neighborhood.